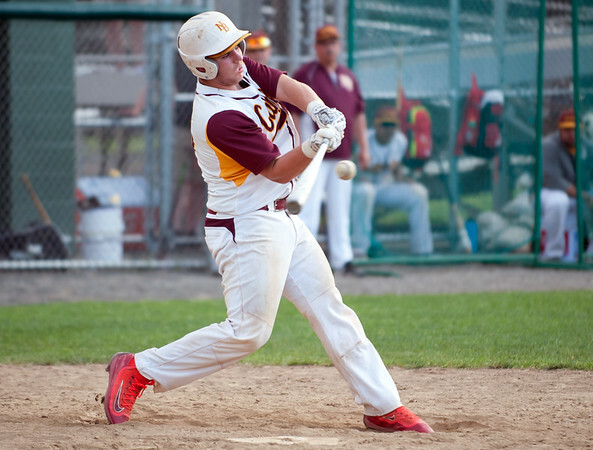 NEW BRITAIN - Chris Gibbs certainly impressed during his first varsity start for the New Britain baseball team on Tuesday afternoon. He just didn’t have much offense to back him up. The Hurricanes’ 15-year-old sophomore threw five innings and allowed three hits and seven runs, but didn’t have much offense to back him up. New Britain managed one hit - a single from Danniel Rivera - in the 3-0 loss to East Catholic at Beehive Stadium. New Britain was able to keep it close throughout in part to Michael Gajda behind the plate, who threw out four Eagles trying to steal. The Hurricanes also thought there was a chance the game wasn’t going to get in due to the rain from Monday and the impending rain on Tuesday. South Windsor 7, Newington 1: Indians head coach Steve Markie knew his team was in for a tough matchup against the Bobcats’ All-State pitcher, Maria Hanchuk. Hanchuk struck out 12 Newington batters and allowed just one hit. McKenna DeLucca got the only hit for the Indians (2-1). She also scored the team’s lone run and stole two bases. New Britain 4, Bristol Eastern 2: It wasn’t the start the Hurricanes had hoped for, but they made sure to end their match against the Lancers on the right note. After dropping the first two singles matches on Tuesday afternoon, New Britain won the next four (two singles, two doubles). Claire Palin defeated Sara Stadnicki 6-2, 6-2 in the third singles games, while Audrey Belliveau defeated Ashlee Lewandoski, 6-3, 7-5 in the fourth. Meanwhile, the duo of Yajaira Asimbaya and Danya Alboslani beat Val Blanchard and Leah Mastroianni 7-5, 6-1 in the No. 1 doubles match, with Zoe Hyres-Buley and Layla Shabooh defeating Megan Yates and Laney Kosakowski 6-2, 6-3 in the second. Southington 7, Plainville 0: The Blue Knights experienced proved to be too much for the Blue Devils. Matt Balaoing, Andrew Kudla, Kyle Narowol and Kade Savino recorded singles wins for Southington, while the duo of Jacob Sutton and Bill Wadolowski; Vatsa Sheth and Ryan Klinzmann; Pio Castellano and Dan Mathew came away with doubles wins. Maloney 229, New Britain 247: Manny Benitez recorded the second-best score of the day in the Hurricanes’ matchup with Maloney, but Matt Bahre came away as the medalist by shooting a 47 in an eventual victory for the Spartans, who dealt New Britain a loss in its season opener. Dylan Washington and Arthur Bell rounded out the top-three finishers for the Hurricanes with scores of 60 and 62, respectively, while Brandon Carlina recorded a 68 on the day. Josh Farnsworth and Ben Reece each shot a 59 for Maloney. Norwich Tech 253, Goodwin Tech 296: The Gladiators are still in search of their first win of the season. Cristian Molina was Goodwin Tech low scorer on the day with a 69, while Xavier Irizarry (71), Ethan Torres (78) and Nathan Berube (78) rounded out the team’s top four. Norwich Tech’s Jared Schraeder was the medalist of the match after shooting a 53. Posted in New Britain Herald, Goodwin Tech, New Britain, Newington, Plainville, Southington on Tuesday, 9 April 2019 21:01. Updated: Tuesday, 9 April 2019 21:03.